Description: Here is page 15 of a 30-page booklet published by the Pennsylvania Railroad entitled "Modern Locomotives and Cars 1939." Top Photo: Shown here is PRR engine #3908 ~ an ES-6 built by EMD during 1937, renumbered as "5911," and retired in 1958. Bottom Photo: Shown here is PRR #4666, a "Doodlebug" built by Brill during 1930. Description: Doodlebug. Here is an original telephoto view that I took of Pennsylvania Railroad equipment in Hollidaysburg, Pennsylvania, on 03 September 1965. Shown here (L to R) are PRR #9203 and #4666. #9203 is an ES-6 built by EMD in 1949 and rated at 600 horsepower. It is simply idiling-away at the end of a busy week. #4666 is a J.G. Brill Gas-Electric Model 660 "Doodlebug" built in 1930. It has been retired from active service on the PRR and is awaiting final disposition. Some fates are kinder than others: #9203 was retired by the Penn Central Railroad around 1978, while #4666 was reconditioned for excursion service and still exists as of 30 July 2016 ~ that's 86 years! Description: Museum Bound. Here is an original photo that I took of Pennsylvania Railroad equipment in Hollidaysburg, Pennsylvania, on 18 September 1965. Shown here is a front-quarter view of PRR #4666, a J.G. Brill Gas-Electric Model 660 "Doodlebug" built in 1930. It had been retired from active service on the PRR and was awaiting final disposition in the Hollidaysburg Yards. 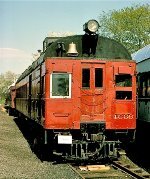 Eventually, it was reconditioned for excursion service ~ including the Arcade & Attica Railroad, the Penn View Mountain Railroad, the New Hope & Ivyland Railroad, as well as the Black River & Western Railroad. 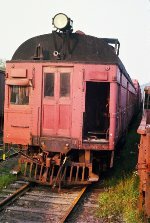 As of 02 July 2016, it belongs to the Allentown & Auburn Railroad in Kutztown, Pennsylvania. Description: Doodlebug. Here is an original photo that I took of Pennsylvania Railroad equipment in Hollidaysburg, Pennsylvania, on 18 September 1965. Shown here is a front-quarter view of PRR #4666, a J.G. Brill Gas-Electric Model 660 "Doodlebug" built in 1930. Description: Doodlebug. Here is an original photo that I took of Pennsylvania Railroad equipment in Hollidaysburg, Pennsylvania, on 18 September 1965. Shown here is the power plant of PRR #4666, a J.G. Brill Gas-Electric Model 660 "Doodlebug" built in 1930. It is a 12-cylinder, in-line engine rated at 415 HP. Description: Doodlebug. Here is an original photo that I took of Pennsylvania Railroad equipment in Hollidaysburg, Pennsylvania, on 18 September 1965. Shown here is a frontal view of PRR #4666, a J.G. Brill Gas-Electric Model 660 "Doodlebug" built in 1930. Description: Doodlebug. Here is an original photo that I took of Pennsylvania Railroad equipment in Hollidaysburg, Pennsylvania, on 18 September 1965. 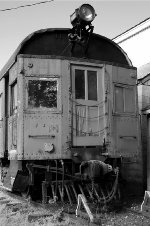 Shown here is a rear-quarter view of PRR #4666, a J.G. Brill Gas-Electric Model 660 "Doodlebug" built in 1930. Description: Doodlebug. 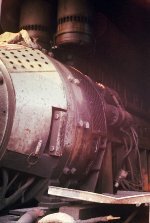 Here is an original photo that I took of Pennsylvania Railroad equipment in Hollidaysburg, Pennsylvania, on 18 September 1965. Shown here is the engineer's cockpit of PRR #4666, a J.G. Brill Gas-Electric Model 660 "Doodlebug" built in 1930. Description: Doodlebug. Here is an original photo that I took of Pennsylvania Railroad equipment in Hollidaysburg, Pennsylvania, on 18 September 1965. Shown here are the passenger compartments of PRR #4666, a J.G. Brill Gas-Electric Model 660 "Doodlebug" built in 1930. Description: Black River & Western Doodlebug 4666 (ex-PRR) rests at Ringoes, NJ in April, 1977. Description: Doodlebug. Here is an original 35mm color slide by an unidentified photographer that was taken near Lambertville, New Jersey, in the Summer of 1980. Shown here is ex-Pennsylvania Railroad #4666, a J.G. Brill Gas-Electric Model 660 "Doodlebug" built in 1930. In this context, it's 50 years old and in excursion service with the Black River & Western Railroad. Description: BDRV 780 powers todays Flemington - Ringoes passenger train. Description: PRR Doodlebug 4666 sits next to the Ringoes shops of the BR&W. One day it will ride again. Description: Anyone know if this will return? Description: PRR Doodlebug 4666 at Ringoes. Title: Will This Run Soon? Description: After many years of restoration, PRR 4666 still sits next to the shop. Description: One day both will traverse the BR&W again. Description: The Doodlebug sits by a former PRR flatcar with a very nice display of farm tractors. Description: Pennsylvania Railroad Doodlebug car #4666. Title: A Pennsy Freehold Line Veteran! Description: PRR 4666 was a doodlebug that was often assigned to the PRR Red Bank to Trenton line Via Freehold. Where she once ran I now photograph SA31. It would be nice to see this old girl coming down the FIT though!